If you have social anxiety disorder, you have about a 20% chance of also suffering with alcohol abuse. About 2% to 13% of the general population is estimated to have social anxiety disorder (SAD), making it potentially the third most common disorder behind depression and alcoholism. It's no wonder, then, that these two disorders often occur together. Which usually comes first: SAD or alcoholism? If you have been diagnosed with both disorders, chances are that you were diagnosed with SAD first, about 10 years before developing a full-blown problem with alcohol. 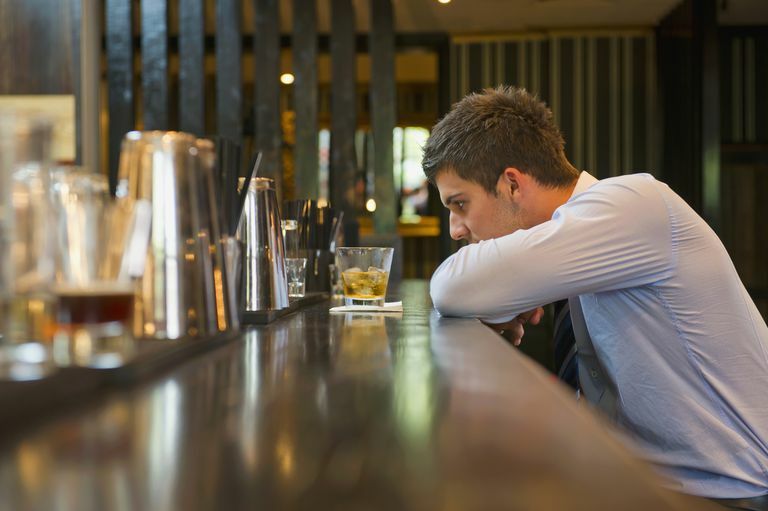 Most people say that they first start drinking as a way to manage social anxiety. Over time, drinking habits can develop and become a problem in their own right. Drinking too much can hurt your personal relationships, affect your life at school or work, and may even lead to problems with the law. If you have been diagnosed with alcoholism and SAD, treatments that are used with people who have just SAD may not be as helpful for you. If you are a teenager or young adult, chances are that your drinking has not yet developed into full-blown alcoholism. At this stage, if you are drinking, it is probably just a coping strategy for situations that make you anxious or nervous. If you are in this age group, standard treatments for SAD will probably be helpful in overcoming your social anxiety and may even prevent a problem with alcohol from developing. However, if you have already been diagnosed with alcoholism, treatment for SAD alone is not likely to help you overcome your problems with alcohol. By the same token, treatment designed for alcoholism alone is not likely to help you overcome social fears. Your doctor or therapist should design a treatment plan that takes into account the unique problems that go along with having both SAD and alcoholism. For example, receiving treatment for SAD first might make it easier for you to take part in treatment for alcoholism such as group therapy or Alcoholics Anonymous. Certain medications used in the treatment of SAD may not be recommended for people with alcoholism. Monoamine oxidase inhibitors (MAOIs) interact with tyramine, an amino acid found in some alcoholic beverages. Mixing alcohol and MAOIs can be a potentially dangerous combination and therefore may not be recommended for people who have problems with alcohol and are likely to drink. Benzodiazepines and alcohol both affect an area of the brain responsible for maintaining breathing; mixing the two substances could shut down that area of the brain with potentially fatal consequences. Benzodiazepines can also be habit-forming and therefore may not be recommended for people who have a tendency toward addiction. Selective serotonin reuptake inhibitors (SSRIs) are usually the best medication option for treating SAD in people who also have alcohol use disorders. SSRIs are not habit-forming and there is some evidence that one particular SSRI, Paxil (paroxetine), may reduce the use of alcohol as a coping strategy in social situations. Despite these advantages, one does need to exercise some caution in using alcohol with SSRIs as the effects on the central nervous system can sometimes be unpredictable. People who are treated for alcohol problems but not underlying social anxiety are more likely to start drinking again than people who don’t have SAD. In fact, in terms of anxiety disorders, SAD is linked to the highest risk for drinking after ending alcoholism treatment. If you think about it, this makes sense. Many people who have SAD report that drinking is their number one coping strategy aside from avoiding social situations altogether. Treating an alcohol problem without providing appropriate coping strategies to manage social anxiety doesn’t give people the tools needed to overcome both problems. If you suspect that you have a problem with both social anxiety and alcohol, it is best to see a doctor or therapist to talk about the difficulty you are having in both areas. Together you can create a plan for treatment that will address your concerns. Remember that these problems developed over a long period and that they won’t be solved overnight; however, by seeking treatment you are making the first step in the right direction. Kushner MG, Abrams K, Thuras P, Hanson KL, Brekke M, Sletten S. Follow-up study of anxiety disorder and alcohol dependence in comorbid alcoholism treatment patients. Alcoholism: Clinical and Experimental Research. 2005; 29(8): 1432-1443. Randall CL, Johnson MR, Thevos AK. Paroxetine for social anxiety and alcohol use in dual-diagnosed patients. Depression and Anxiety. 2001; 14: 255-262. Randall CL, Thomas S, Thevos AK. Concurrent alcoholism and social anxiety disorder: A first step toward developing effective treatments. Alcoholism: Clinical and Experimental Research. 2001; 25(2): 210-220. Thomas SE, Randall PK, Book SW, Randall CL. A complex relationship between co-occurring social anxiety and alcohol use disorders: What effect does treating social anxiety have on drinking? Alcoholism: Clinical and Experimental Research. 2008; 32(1): 77-84.Alcoholism: Clinical and Experimental Research. 2005; 29(8): 1432-1443.